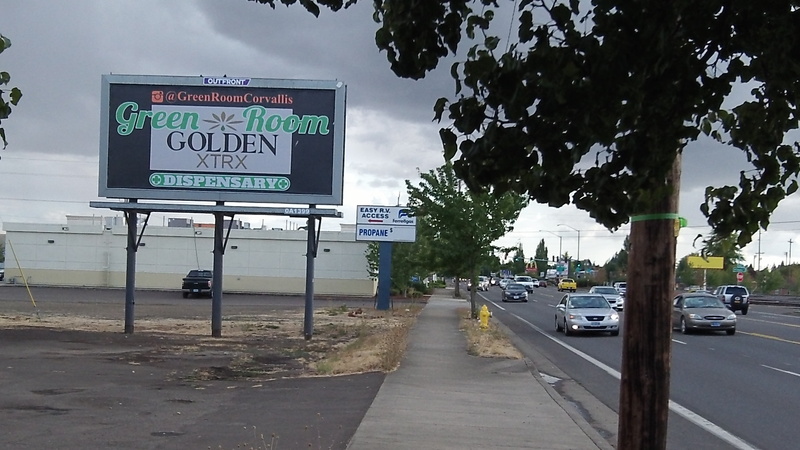 This billboard on Pacific Boulevard in Albany advertises a Corvallis pot dispensary. It’s becoming apparent that Oregon will end up with a patchwork of local marijuana laws, thanks to the 2015 legislature, and one likely effect is more driving around by users looking to legally buy recreational weed. The legislature passed HB 3400, which gives cities and counties authority to take exception to some of the provisions of Measure 91, approved last November. The measure legalized the recreational use of marijuana by adults and set up a procedure for licensing retail stores by the Oregon Liquor Control Commission. Under HB 3400, local authorities can’t make it illegal again for adults to use recreational marijuana, but they can at least try to prohibit its cultivation, processing or sale. In Linn and Benton counties, any ban would be subject to a referendum in November 2016, but until then the ban would be in effect. So far, 16 small Oregon cities and six counties have notified the liquor commission that they are banning licensed recreational marijuana producers, processors, wholesalers and/or retailers. As of Sept. 3 the list included the cities of Brownsville and Sweet Home in Linn County. The Brownsville and Sweet Home bans — covering production, processing and wholesale and retail sales — will go to the voters in the 2016 general election. That’s because Linn County voters disapproved of Measure 91 by less than 55 percent. If the no votes been 55 percent or more, the councils could impose the bans on their own. The Lebanon City Council plans to discuss possible marijuana action on Sept. 9. Last spring it voted to deny city business licenses to marijuana stores, effectively banning them, but it’s unclear — at least to me — whether that too would be subject to a referendum next year. In Albany, Assistant City Attorney Sean Kidd recently gave the council a briefing on its options under the new law, but so far no action has been proposed. Banning “licensed” operations will just result in a greater black market. That means NO TAXES collected. Leave it to a bunch of politicians to completely screw up what should have been so simple…..Complete idiocy that is self defeating if the goal is to eliminate the underground market. Nothing like taking a .44 mag with hollow points to both feet. And meanwhile…alcohol and nicotine continue to kill at unprecedented rates and social cost. We at Albany’s Canna Kitchen/Gramsterdam won’t be selling to the recreational market, we’re staying Medical only – but I know there are 3 or 4 other dispensaries in Albany that are ready for the flood of recreational buyers. I do hope our elected officials will listen to the will of the people on this one and collect the tax they are willing to pay. The medical community has been paying quite the “tax” for permission slips since 1998. The State of Oregon currently takes in more than $7 Million a year in excess fees after ALL program costs are paid for with fees from patients in the OMMP. In fact, with the uptick in cardholders in recent times, it’s probably at about 8 million by now, and they won’t even hire more employees to get cards issued faster. Blessings! I’m wondering if there’s any connection between the 60% approval vote in Corvallis for recreational marijuana and their difficulty in figuring out how to navigate a roundabout as mentioned in previous commentaries.